The Angel Villa in Santorini can be found on the left hand side of the island's main town, Oia, in a quiet area, a mere 3 minutes walk from the town center. 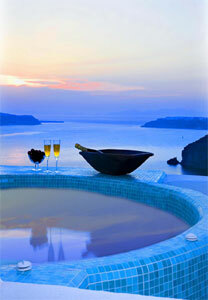 From the Villa you can view Oia, Thirasia, Kameni, Imerovigli, and the spectacular Caldera. The Angel Villa awaits your arrival to introduce you to the secrets of the island in a way that will make your journey an unforgettable experience. English, Greek, French, Italian, German and Spanish. We will meet you at port or airport and transfer your party to the villa. On your departure date, our transfer company will collect you and transfer you to the port or airport. Kindly advice us of your arrival/departure time, flight number or name of ferry. We will deliver a breakfast basket with a selection of croissants, Greek cake, marmalade, honey, butter, Greek yoghurt, fresh fruit, orange juice, tea or coffee for you to enjoy at your leisure. 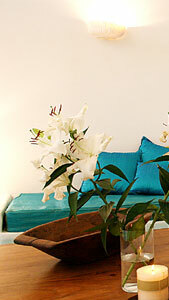 is provided on your arrival to welcome you to the Angel Villa. 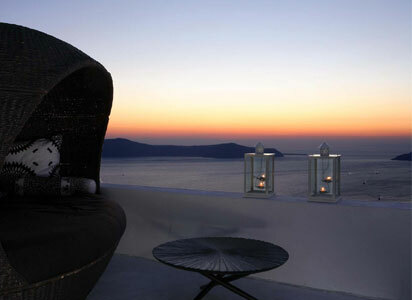 The Angel Villa is located in one of the most extreme and enviable positions on the Caldera in Oia. Perched on the cliff face of the Caldera, the villa is an exquisite sanctuary with a spectacular view of the sea below. Its architectural signature is eclectic; on one hand traditional and on the other, contemporary. The stone exterior blends perfectly with the smooth white lines and the hand-made azure Italian tiles of the interior. This ‘canava’ – cave house – can comfortably accommodate parties of up to 9 guests. Approached via an intimate and inviting courtyard, one enters a vast living area, complete with high vaulted ceilings in the traditional Santorinian style. Adding to the ae tis phombience of the living space are the use of hand-made marble up-lights and the use of Swarkovski crystal lampshades. The open-plan living area is the perfect place to relax. The richly appointed dining room promises moments of gastronomic delight, prepared either by yourselves or a chef, upon request. 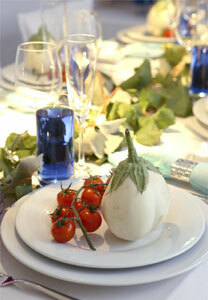 The dining room is serviced by a well equipped galley-style kitchen. The living room offers the opportunity to unwind, choosing a movie or CD from the library. 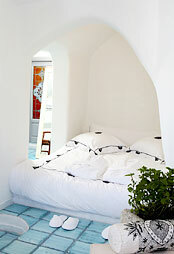 The Angel Villa is furnished to a high standard in the traditional style of the Cycladic islands. It is fully air-conditioned and has 24 hour access to the internet.